With over 40 articles published over the last two years, we have been major cheerleaders for Brightline since the day it was announced. And why not? The notion of traveling from West Palm to Miami without the hassle and and near-death experiences of an I95 commute by car is a dream come true. When service officially started in May, we decided it was time to give it a go. The timing was interesting. The day before, we had to attend a graduation ceremony in Ft. Lauderdale. The trip took over an hour as there were four wrecks and the occasional heart stoppage from no warning, lane-change drivers. Our trip on Brightline couldn't have been more of a contrast. From the almost zen-like lounge to the relaxing comfort of the seats, it was all about exhaling and relaxing. Join us on the journey as we ride the Brightline rails for the first time. 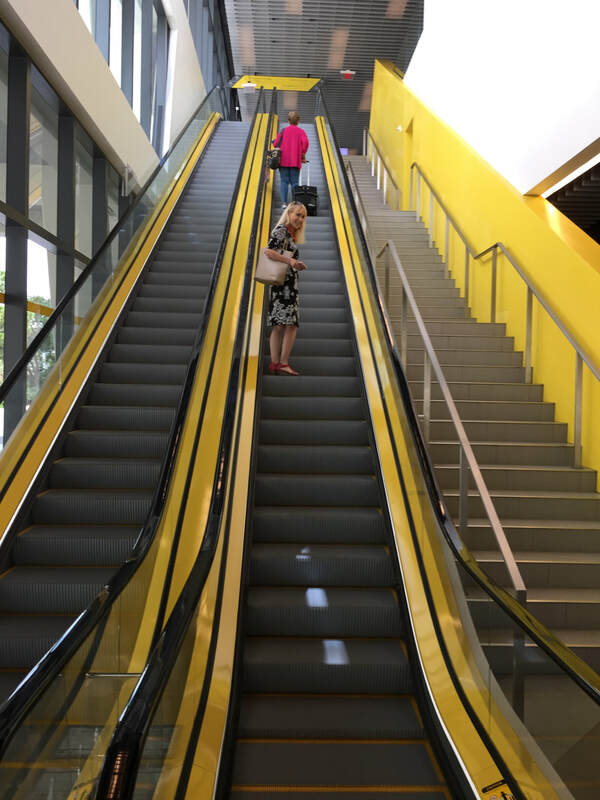 ​Pam on the first leg of the journey, heading for the lounge area in the West Palm Beach Brightline station.